The July 2 issue of the New England Journal of Medicine has an article on the prevention of diabetic nephropathy and retinopathy that will elicit much attention. It concludes “Early blockade of the renin-angiotensin system in patients with type 1 diabetes did not slow nephropathy progression but slowed the progression of retinopathy.” An accompanying editorial reached the same conclusion. This finding is surprising. Angiotensin blockade is standard treatment for patients with diabetic nephropathy at any stage and is often given to diabetic patients before they show signs of kidney disease. I’ll just focus on the renal findings. The conclusion is misleading on two counts. The first is that the design of the study excluded patients who were most likely to benefit from angiotensin blockade and the second is that the data are, in my view, improperly interpreted. The exclusion criteria were microalbuminuria, hypertension, and a glomerular filtration rate (GFR) of less than 90 ml/min. Thus the patients followed were at lower risk to show major progression of diabetic nephropathy than those who already had clear signs of it. But let’s ignore this and just look at the data in the study. This is the key finding that is ignored both by the study authors and the editorialists. Angiotensin inhibition with enalapril prevented mesangial expansion. The authors try to explain away this critical observation by saying that the MFV at five years was not significantly different across the three groups. So what! Mesangial expansion did not occur in patients treated with an ACE inhibitor. These data indicate that angiotensin blockade with an ACE inhibitor but not with and angiotensin receptor blocker prevents progression of diabetic nephropathy. This important observation is thrown away. It’s also missed by the three editorial writers. Doubtless the press and many physicians will also miss it. Progression of microalbuminuria was a secondary outcome. None of the groups had microalbuminuria (defined as 20 to 200 µg/min ) at the start of the study and none had it at the end, though it did go from 6.5 to 10.6 in the losartan group. This is statistically significant, but seems likely to be of little or no clinical significance as it’s not even close to being outside the normal range. Yet the editorialists say “Inhibition of the renin-angiotensin system did not reduce the incidence of microalbuminuria…” They doubtless were looking at how many patients within each group developed proteinuria even though albumin excretion was not abnormal in any group. 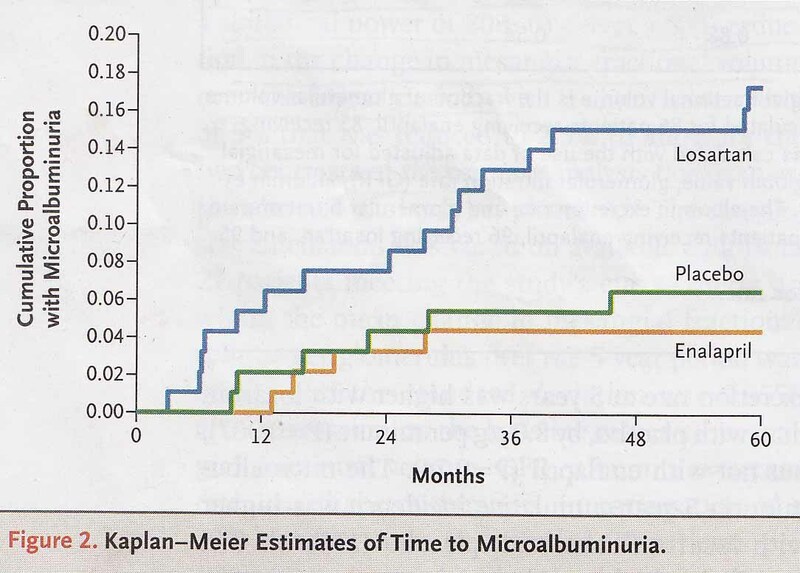 At the end of five years 18% of the losartan group had (see figure) microalbuminuria. In the placebo group 6% had increased albumin excretion, while only 4% of the enalapril group had an increase and no patients on enalapril developed it over the last 2.5 years of the study. This again suggests a beneficial effect of ACE inhibition and a possible deleterious effect of the ARB. This makes the above statement seem a big stretch. “The GFR decreased similarly in all three groups; by 6.6 to 8.9 ml/min (p<0.002 in all three).” But the GFR was still at least 120 ml/min. These data require an interpretation not offered in either the paper or the editorial. The blood pressure was lower in the two treatment groups. Angiotensin blockade can lower GFR at the same time it’s preserving glomerular function. I can’t be sure, but it is nevertheless possible that enalapril lowered GFR because of both a greater effect on blood pressure and a direct renoprotective effect on the glomerulus, while GFR in the placebo group fell because of disease progression. In other words, if the study were longer the GFR might have been much lower in the placebo group than in the enalapril treated patients. What to make of this ambiguous study? I think that current treatment of patients with incipient diabetic nephropathy, regardless of whether type 1 or type 2, is best done with ACE inhibition. At the very least more study is indicated to resolve the issues I’ve discussed and which this paper leaves uncertain. Excellent analysis. It is interesting how soft the data is interpreted, even by “respected” editors from a respected journal (NEJM). Cases like this are not the exception (unfortunatelly). The problem comes when most people that reads these type of articles start making decisions (without thoroughly analyzing the data) or recommendations. I don’t know how an editor could be that soft, is this corruption? is this part of helping friends to publish something in an important journal with strong support from important people? I don’t believe that this was an omission. Do you have an answer about my whys? The most likely explanation is inadvertence. Editors usually don’t rigorously read the papers they receive. Rather they rely on their reviewers who often miss important parts of a study. Villainy is almost never the answer.